Looking for something fun to do this coming Friday, October 4? Want some free food? 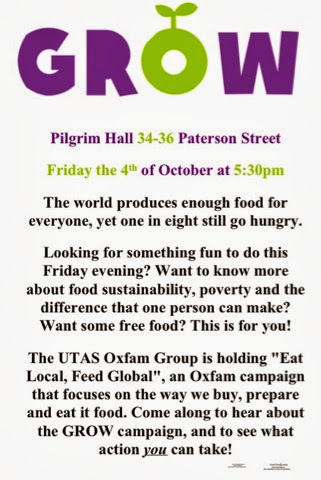 The UTAS Oxfam Group is holding "Eat Local, Feed Global", an Oxfam campaign that focuses on the way we buy, prepare and eat it food and how this affects not only us in Tasmania, but on the global scale. Come along to hear about the GROW campaign, and to see what action you can take! The world produces enough food for everyone, yet one in eight still go hungry. Venue: Pilgrim Hall, 34-36 Paterson Street, Launceston. A Uni Oxfam Group event.